It’s important to be knowledgeable about the health issues pertaining to any breed of dog you’re considering adopting. Many people are drawn to small, feisty, fluffy Pomeranians, and becoming aware of their common health conditions will help you to decide whether it’s the right pet for you. You’ll also want to know when you should call the vet and whether or not a condition can be reasonably treated at home. Read on to learn about common Pomeranian health issues and conditions as well as how to treat and prevent them. The Pomeranian is the smallest member of the Spitz family of northern breeds and is a descendent of sled dogs from Iceland and Lapland. Today, it is one of the most popular of the toy breeds. Pomeranians are intelligent, easily trained, active, and very alert. Despite their small size, they can be very bold dogs and aggressive among larger breeds. They can also be very protective of their families, making them good companions and watch dogs. The Pomeranian is typically a very healthy and long-living breed of dog. However, although they have relatively few wellness issues, they do have some common health problems, similar to all breeds of dogs. 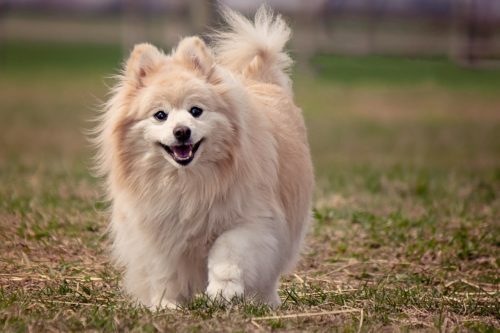 One of the most common health issues with Pomeranians is obesity. Because of their small size, they don’t need much food, so it’s easy to overfeed them. As a Pomeranian owner, it’s important to be aware of portion sizes for your pet’s food in order to prevent obesity. Pomeranians also have a very small a mouth in relation to their teeth, which can result in overcrowding. This can cause various teeth and gum problems, such as tartar or plaque buildup, when food gets trapped between their teeth. If plaque is not removed, your pet can get gingivitis or another gum disease, which can lead to premature tooth loss. Because of this, it’s very important to keep your Pomeranian’s teeth clean by brushing them on a regular basis. In addition to brushing his teeth, you can help keep your dog’s mouth clean by giving him dental biscuits or dental chew toys. Furthermore, feeding your dog a healthy diet will help him maintain a healthy mouth. Dry food is better for your dog’s teeth than canned or moist options. Also, avoid poor-quality foods and foods that have a lot of starch or sugar. Hypoglycemia occurs when blood sugar levels suddenly drop. This can be very dangerous for dogs, even sometimes fatal. The condition most commonly happens to puppies under the age of 3 months or small breeds of dogs. The signs can appear quickly and include weakness, loss of appetite, lack of coordination, shaking, muscle twitching, or seizures. Pomeranian owners should keep honey in their home and give it to their pet immediately after noticing symptoms of hypoglycemia. Your dog should then be taken to a veterinarian right away for professional treatment. A coat loss condition, sometimes referred to as Severe Hair Loss Syndrome (SHLS), can affect Pomeranians. SHLS occurs mainly in male breeds and will often arise later in a dog’s life. Your pet may start out out with a normal, healthy-looking coat that slowly thins out over time. The thinning will typically start at the back of the thighs and move up his back. It’s a good idea to become familiar with the symptoms of coat loss in Pomeranians, as early detection is a major factor for proper prevention and recovery. Canine cataracts are one of the most common problems affecting the eyes of dogs. 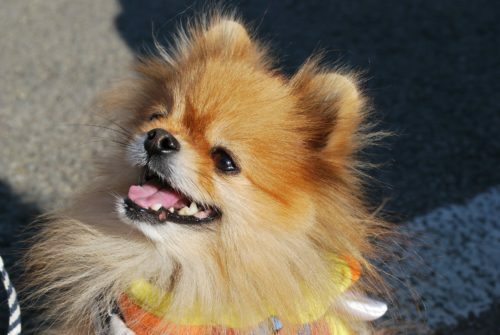 Toy dogs, including Pomeranians, are more prone to this health problem than larger breeds. There are many different forms of canine cataracts which can develop for a variety of reasons and appear at any age. Symptoms include a change in eye color (sometimes gray or white), bumping into walls due to blurred vision, or swelling or redness of the eyes. If you suspect that your Pomeranian has cataracts, a veterinarian will be able to diagnose it by performing an eye exam. Many cataracts are able to be surgically removed, but early detection is vital. If left untreated, it can lead to blindness. Luxating patella is a common health issue in Pomeranians that affects the knee joint. This condition can occur due to a malformation of the bone or from an injury when the kneecap slips out of place. Pomeranians may sporadically show symptoms of luxating patella, typically in the form of sharp pain in their knee caps. Owners may notice that their dog yelps loudly but seems okay afterward. After several days, swelling can develop, which often leads to ongoing discomfort. Without treatment, this health issue will usually get worse. In moderate to severe cases, surgery may need to be performed in order to get the kneecap back into place. A collapsed trachea is a common health issue with Pomeranians. The trachea (windpipe) is supported by rings that are made out of cartilage. With small dog breeds, the cartilage is more prone to injury. While the condition can be related to genetics, it is preventable in some cases. Signs of tracheal collapse include a unique honking noise, coughing, wheezing, or trouble breathing. Take your Pomeranian to the vet if you suspect he has a tracheal collapse. In very serious cases when Pomeranians don’t respond to other treatment, surgery is performed to stabilize the windpipe. 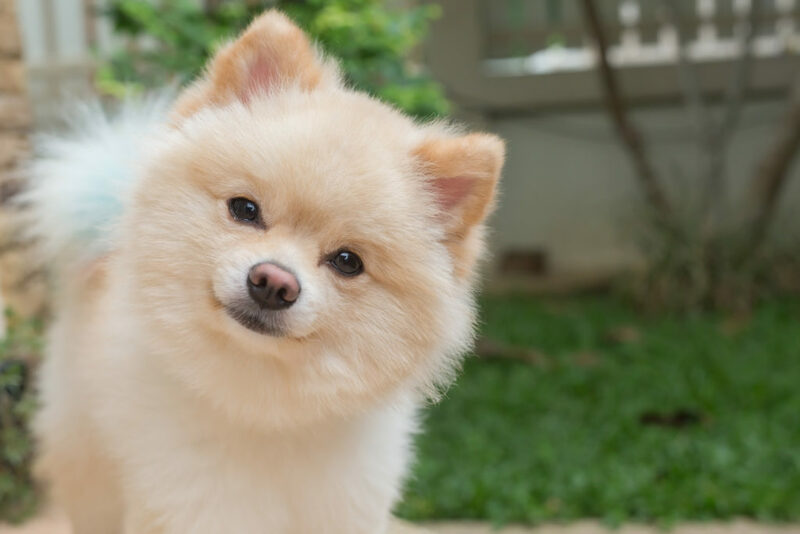 The following seven preventative actions can help you keep your Pomeranian happy and healthy. Choose your pet’s food carefully. Feed your Pomeranian the best quality food possible for all his meals and read labels carefully. Avoid chemicals or additives which can cause skin reactions, inflammation, or gastrointestinal problems. Exercise your dog every day. Take your Pomeranian outside for a walk or playtime at least twice per day. Bring your adult Pomeranian to the vet for a checkup once per year. Take an older dog to the vet every six months. If you cannot resolve a health issue at home or are unsure what type of condition he is suffering from, don’t hesitate to call your veterinarian. Make sure that your Pomeranian receives all needed vaccinations and booster shots. Use a harness instead of a leash when walking your Pomeranian. This will help to prevent neck injury or a collapsed trachea. Clean your dog’s teeth each day. At-home dental care is vital for preventing infections and gum disease in Pomeranians. Owners should periodically check and become familiar with taking their pet’s temperature. A rise in body temperature will be one of the first symptoms for many health issues. The condition of a Pomeranian’s eyes is very telling. Clear, bright eyes are a sign of good health. However, discharge, bloodshot eyes, or clouding of the lens are all reasons to get your Pomeranian checked out by a vet. Take note of abnormal discharge coming from your Pomeranian’s nose. It’s common for all dogs to have slight nasal discharge, but be aware if the symptom becomes excessive. Skin conditions such as a dry nose or slight peeling can be a sign of a more serious disease or a just a temporary condition. However, deep cracks or cracks with fluid should be checked out by a vet. Red or irritated skin on the inside of the flap of your dog’s ear, thick wax, or discharge are clear signs of an ear condition. This can indicate that he has fleas, allergies, or another health issue. 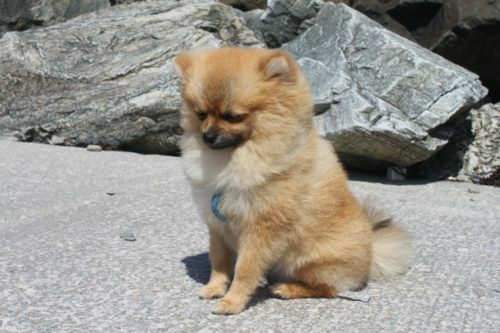 Abnormal breathing can be a sign of illness in Pomeranians. Breathing problems become more common as dogs age, so it’s important to pay attention to his patterns and habits in order to spot a problem before it progresses too far. Any wheezing, gagging, coughing, or other breathing abnormalities should be reported to a vet. As a pet owner, it’s very important to be conscientious of your dog’s health at all times, not just when he appears to not feel well or are exhibiting one of the above symptoms. Regularly checking over your Pomeranian is a vital step in catching problems early. Consult a professional if you are ever unsure whether your pet has a specific condition and make sure to take him to regular checkups. Leo, Denise. “Pomeranian Health Concerns.” Pomeranian Headquarters, 28 July 2018, Accessed 23 Sep. 2017. www.pomeranian.org/pomeranian-dog-health-issues-explained/. “Common Pomeranian Health Problems – See What Real Pomeranian Owners Say.” IHeartDogs.com, Accessed 23 Sep. 2017. www.iheartdogs.com/knowledge-base/breed/pomeranians/what-health-problems-has-your-pomeranians-faced-leave-blank-if-none/. Armstrong, Amy M. “Pomeranian Illnesses.” The Nest, 14 July 2016, Accessed 23 Sep. 2017. www.pets.thenest.com/pomeranian-illnesses-5670.html. “Pomeranian Breed Information.” Vetstreet, Accessed 23 Sep. 2017. www.vetstreet.com/dogs/pomeranian. “Pomeranian Dog Breed Information, Pictures, Characteristics & Facts – Dogtime.” Dogtime, Accessed 23 Sep. 2017. www.dogtime.com/dog-breeds/pomeranian#/slide/1.